Francis Revisited is knitting up oh so quickly! Just the cowl left to go! Great pattern, very easy to follow. I was afraid that the fit wouldn't be very good since all the directions are just so darn simple. My worrying was needless, as it looks good so far, although we'll have to see what blocking does. I know it will grow widthwise. That Eco Wool is great stuff -- affordable, natural, and easy on the hands and wrists. The "Vanilla" shade I used for the Hap Blanket is much softer than the "Mocha" shade here. Curious! A charming book about a young woman coming of age in 1950s London. Rock & roll, a moldering estate her family can't afford, a spot of romance... I enjoyed the narrative voice, and the time period was a welcome change. I often read books written during the period between the wars or set during that time. Precocious Flavia de Luce (once again growing up in a moldering country estate her family can't afford) finds a man dying in her backyard. She aims to get to the bottom of the case, armed with a keen mind, a penchant for chemistry, and a desire to figure out her father's past. This is the best version of the Owl Baby Vest ever, knit and photographed by Luscious Luka (rav): Holy cow, that's hilarious. Thanks for brightening up my day! Photo and knitting credits are all hers. 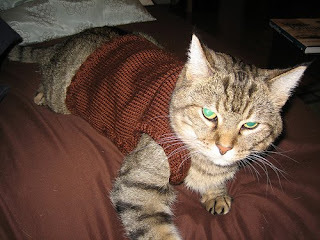 It's gratifying to know that people are actually knitting my patterns; it's even more awesome to see tabby cats modeling them. I have devised the perfect cupcake frosting. Seriously. Combine powdered sugar and cocoa powder. Add butter, espresso, and vanilla. Beat with an electric mixer on low speed till combined. Beat for 1 min. on medium speed. Cool for 15 min. or so. This frosts 24 cupcakes or the tops and sides of 2 8- or 9-inch cake layers. Thai Beef with Chiles and Basil over Coconut Rice was a huge hit Monday night. I don't usually eat beef, but I made an exception for this. Very easy to make, to boot. Bright Star, the new movie about the Romantic poet John Keats is coming out soon, and Tony Scott has written a wonderful review of it in today's NYT: "Keats and His Beloved in an Ode to Hot English Chastity." How's that for a review title? Very nice! I only wish I had seen this one at Renegade, too. J'aime le café. We went to the Wicker Park location of Jerry's for lunch, and it was fabulous -- a dizzying array of delicious vegetarian sandwich combinations. So many veggies and cheeses, YUM! 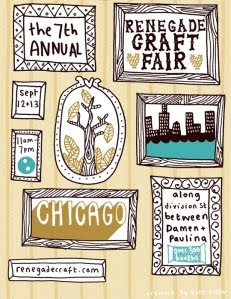 I'm missing out on Wisconsin Sheep & Wool this year, as my budget just can't take two big crafty events in one weekend. This is especially sad since I drank our last Spotted Cow (available only in WI) as I typed this post. Stitches Midwest is this weekend, too, but I'm not one for convention centers. Speaking of designs, here's a teaser of a baby sweater design I'm working on. 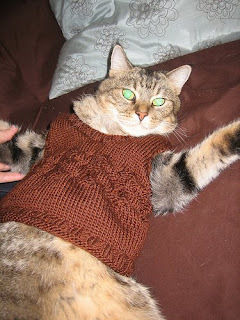 I need to do some tweaking and knit up a second version, so it may be a couple weeks before I release it. 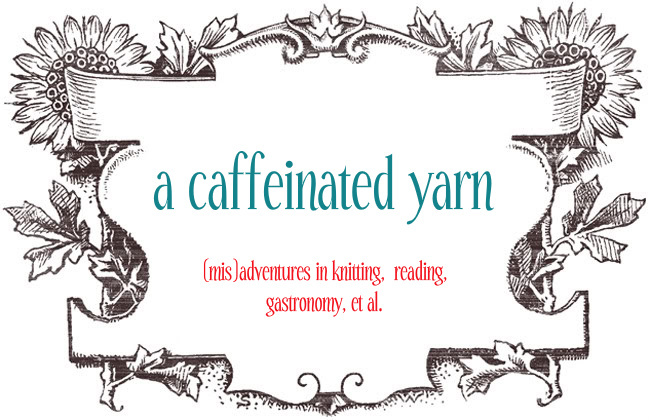 I've been knitting a bit less lately, and spending more time reading, cooking, taking guitar lessons, and working on ye olde dissertation. And just plain trying to make the most of the last gasp of summer by getting outside, picnicking, going to the farmer's market, and catching up with friends at BBQs. It's the After Hours Shawl pattern, knit up in Briar Rose Celebration, both purchased at the Midwest Fiber and Folk Art Fair this past summer. The colors remind me of mermaids, and I've been listening to one of my favorite low-key albums, the Dirty Three's Ocean Songs, while knitting. The colors and sheen are fabulous, but I'm not sure bamboo is for me. I'm not the world's most dedicated sock knitter, so it's a good sign that I've already turned the heel. I was supposed to alternate the pumpkin patterns both horizontally and vertically. Oops! That's what I get for not reading directions, but I'm sure as heck not going back now. We also bit the bullet and finally bought a new computer. I went for the iMac, and now I'm trying to figure out iPhoto and all that good stuff. Plus I still need to install a bunch of new software, which is a fairly major expense when coming from a PC.